Genuine Leather differs from Bonded Leather in that it consist of a single piece of leather, not many bonded pieces. 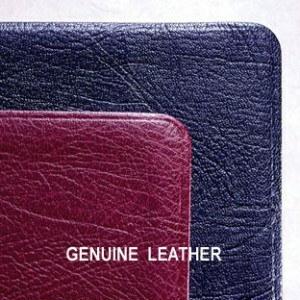 Genuine Leather is made from first quality animal hides (usually pig or cowhide). It has a finely grained texture, and with proper care, Genuine Bibles should last a lifetime. (Note: The above pictures of Genuine leather are to depict the style of leather only not the actual colors. 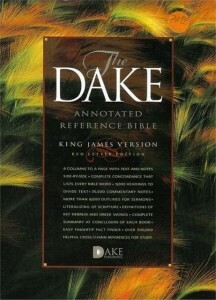 Shades of Black and Burgundy Bibles may be lighter or darker than those shown here. 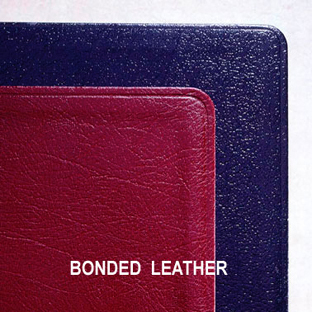 Bonded Leather is made from real leather. However, as the name suggests, the cover is made from leather pieces that are bonded together with latex. Once bonded, the leather is dyed, cut and embossed to look like genuine leather. The look and feel is as genuine leather (though not high-grade leather). Because it is made of various pieces, it is not as durable as the genuine leathers and is therefore less expensive. (Note: The above pictures of Bonded leather are to depict the style of leather only not the actual colors. Shades of Black and Burgundy Bibles may be lighter or darker than those shown here. Hardbacks are more durable than both paper or kivar bound books. They are slightly more expensive than the paperback or kivar bindings; however, they are more economical than leather bindings.